There is something inherently elegant about glass prisms. These lighting accessories feature a light bulb combined with a glass or plastic optical element that is designed to refract light with its flat, angled, highly polished surfaces. As they catch and scatter the light, reflecting it all around the room, glass prisms create a dazzling light display. The addition of even a single glass prism to any room can instantly create an air of opulence and enchantment. These seemingly simple ornaments have the power to turn a front room into a resplendent dining room for example. 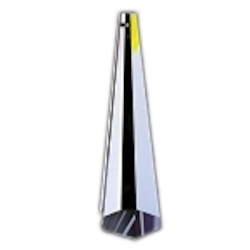 Our wonderfully expansive collection of prisms has something to suit every home. Whether you want something classic and timeless or modern and geometric, rustic, vintage or wonderfully quirky, you will find plenty of inspiration in this range. To help you to navigate our prism collection, below you will find a useful guide to some ways in which you can incorporate these gorgeous accessories into your existing home decor. So, read on to get some handy design ideas about how to make your new prism work well with light, soft furnishings and color schemes. Deck prisms are an excellent accessory for turning a plain stretch of decking into a magical walkway that is lit up with shimmering white or rainbow colored light. Deck prisms can be used outdoors or indoors, and they were originally used to provide both light and ventilation to the lower decks of a ship. Place your deck prisms at regular intervals along a wooden walkway down to a lake, or use them simply to illuminate an outdoor dining area by planting them in a wooden platform in your back yard. The reflection of light on water is always a beautiful thing to behold and the marriage of light, water, and prism glass is a match made in heaven. Deck prisms can also be used indoors. If you have a wooden floor in your front room or bedroom, for example, they are a very quirky and unusual way to light up the room – from beneath. Floor lighting is an somewhat underused interior design option and it can create a very sophisticated look and a charmingly soft glow. In addition, if you have a small loft space that you would like to make the most of, installing some deck prisms in the wooden floor will bring some brightness and a sense of space into this little cubbyhole in a way that is much more elegant than the traditional bare light bulb hanging from the ceiling that you so often find in tiny attics. One of the most sumptuous ways to use a light prism is to incorporate it in to a chandelier. Classic centerpieces to dining rooms, master bedrooms and grand halls alike, chandeliers will never go out of fashion. What was once an unassuming bedroom can quickly become a magnificent suite with the addition of a sparkling chandelier on the ceiling. And, our collection of crystals for chandeliers enables you to customize your chandeliers and make them as bold and beautiful as can be. 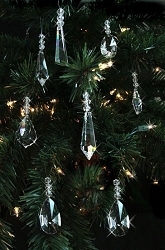 Why not create a fairytale look with a set of hanging teardrop crystals, for example, all of them arranged to create a cascading effect, lit by a central cluster of bulbs? This will make for an unforgettable focal point to a room: a waterfall of glass and light, sparkling, shimmering and almost seeming to move in the fluid manner that is associated with a real waterfall. Or, you can replace the traditional candle style bulbs that are so often seen in chandeliers with a set of carefully shaped chandelier prisms that are all placed over a single small light bulb. 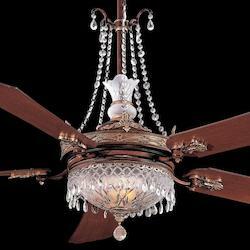 Chandeliers work very well with light colored furnishings, such as cream-colored walls and soft white carpets. However, if you want to emphasize the opulence of a given room, try incorporating your chandelier and its prisms with some antique gold embellishments – for example a matte gold frame to a mirror or a golden border to a section of wallpaper will both look absolutely breath taking with a chandelier. Though most chandeliers use clear crystals (and prism shaped crystals are no different here), you can also experiment with different hues. Adding in some red chandelier crystals parts into your chandelier, for example, is an excellent way to establish a moody, atmospheric feel. So, why not have a think about what color schemes you want to use in the room where you chandelier is going to go? Then, alongside your prisms, you can add in some colored chandelier crystals to create a subtle tinted effect to the light that shines from this light fixture. Moreover, when it comes to chandeliers, you can play around with form as well as with color. 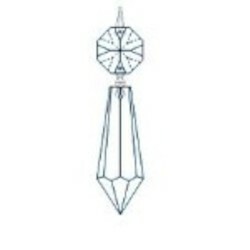 Many glasses with prism elements have straight, almost geometric shapes, for instance, and you can complement this with some more rounded chandelier drop crystals. 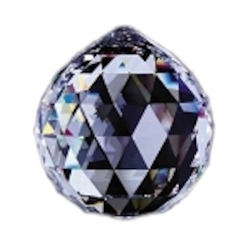 Or, you can search for prisms that have been carved into specific designs such as flowers, stars or globes. Echoing the patterns on your wallpaper is another great way to tie together the interior decor in a given room in order to give it a fantastically harmonious look. However you use them, though, glass chandelier prisms will make your living space a whole lot more fabulous. 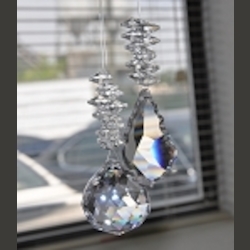 Another fantastic way to explore the potential of prism and light is to opt for some simple lamp crystals to hang from a wall or ceiling lamp. There is no need to choose a full on chandelier for this – you can create an understated, chic look with a few of our crystals for lamps. In bathrooms, for instance, the addition of some aqua colored prisms turns a regular ceiling light into a gorgeous decorative element. Match it with a classic white and turquoise bathroom color scheme – with a splash of gold here and there – to turn that old shower room into one of your favorite place to be. This beautiful use for pendalogue light fixtures will liven up any room in the home, from the living room to the kitchen. Some acrylic crystals in a variety of different hues look wonderful when left to hang in the window of a kids’ bedroom or a nursery. Your children will surely find endless fascination in the play of light and color as they watch those lamp crystal prisms twinkle. And, you can use these glasses with prism to teach them about science (the reflection and refraction of light), too, if you so desire. One hue that is rarely used in this context, but which gives marvelous results, is the color black. 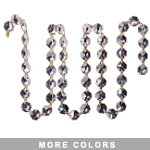 Try incorporating some deep black or indigo crystals into your chandelier and you will see what we mean. This hue works particularly well with red, and it makes for a lovely warm and mysterious light quality that is great for bedrooms, cozy sitting rooms or peaceful studies. Lamp crystal prisms do not just come in the form of hanging prisms, however. 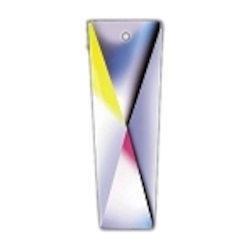 They also can come in the form of prism shades for lamps. 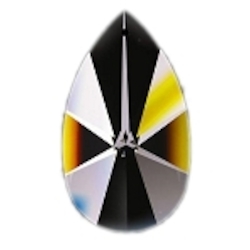 So why not replace your current smoked glass or fabric shades with some dazzling prisms? You will be surprised at how much of a difference it makes. You can use this technique both indoors and outdoors. 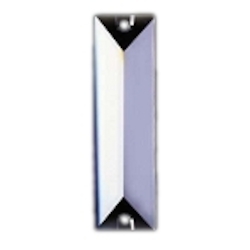 A porch light will look super welcoming when it is fitted with a few plastic prism crystals, for example. 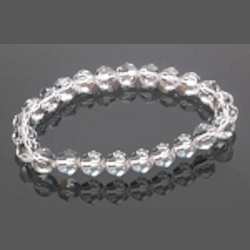 You can use this technique to create a look that is vintage or futuristic, nautical or minimalist, as we have a superb selection of different prisms in our range. 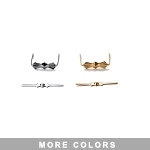 Our collection of accessories contains some remarkable pieces from some of the top names in the interior design world. If you are looking for a light fixture that will be not only a very functional item to have installed in your home but also a work of art in its own right then we will have plenty to inspire you here. However, we also have some excellent discount items in this range. So, if you have been wondering where to buy a glass prism on a budget then you have come to the right place. It is perfectly possible to decorate your home on a tight budget, and if you want a cheap way to add a splash of luxury to your living space, glass prisms are a great accessory to opt in for. We are committed to ensuring that, whatever the price, all of the lights and accessories that we sell are of the very highest quality. So, why not adjust your search terms to reflect your budget and start choosing the glass prisms that will work best in your home? Though the above guide to placing glass prisms in different interior design contexts can apply perfectly to domestic properties, these accessories are also perfect for use in commercial establishments too. Hotels, bars, clubs and offices can all benefit from the addition of some glass prism elements. A hotel lobby will be transformed into a gorgeous ballroom that feels wonderfully large when you affix a chandelier hung with many colored prisms in the center, for example. And, if you want to impress your business clients, adding some prism crystals to the central ceiling lamp of your office is an excellent way to add a sophisticated touch to the room. 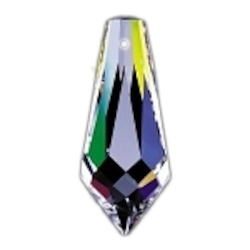 We can sell you your favored prisms wholesale (at a suitable wholesale price), so that you can kit out all of the rooms in your hotel in the same design, or place a set of light fixtures with prism crystals at equal intervals along a long corridor. In short, if you were wondering where to buy some dazzling light fixtures for a commercial building online, you have come to the right place. One important thing to bear in mind is that it is a very good idea to have some replacement crystals to hand. 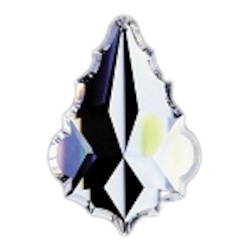 That way, if your prism crystals come loose or get damaged, you can instantly replace them. 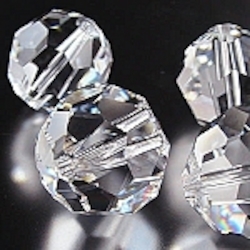 We have an excellent selection of loose and replacement crystals for sale, and purchasing these at the same time as you purchase your chosen light fixture with glass prism accessories is a very smart idea. That way, your light fixture will always look its very best. Another advantage of having some spare crystals to hand is that you can customize your light fixtures if you ever feel the desire to so that they fit in better with the overall ambiance of a room. For example, if you have just re painted the walls in your sitting room so that they are now a dusky orange hue, you can adapt your light fixtures to complement that quite easily by adding in some translucent yellow or ocher colored prism crystals on to your light fixtures. Creativity is the name of the game here, and you can really let your imagination flow free as you create patterns, gradations of different hues blending in to each other, and pleasantly surprising color combinations. 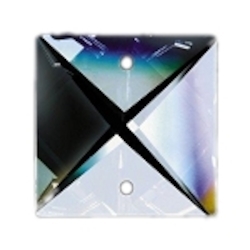 You will have no trouble finding the right glass prisms for your needs in this range. Whether you want something subtle or omissible, traditional or ultra modern, our collection of glass prism elements will cater for your tastes. Whether you just want to add a few subtle, tasteful new notes to a bedroom or whether you are completely overhauling the design of your entire home, there is no doubt that browsing this collection will give you a lot of new ideas. If you are completely redesigning your living space, then make sure to check out the other products that we have on offer too (such as standing lamps, ceiling lamps and patio lamps) so that you can get the house of your dreams as easily as can be.